Survivors of typhoon Haiyan in the Philippines face tragic conditions as they desperately seek to leave chaos behind. Official sources reveal that more than 350,000 people are currently awaiting supplies in 1,220 evacuation centres, while across the whole country, 4.3 million people are disperatly in need of clean water and food supplies. In the small coastal city of Tacloban, in Leyte province, survivors are searching for food, water and supplies through jagged pieces of debris, uprooted trees and, more grimly, piles of dead bodies. Her the fury of the 195mph winds of the strongest storm ever recorded, turned roads into rivers of sewage and seawater, bridges into crumbles, and landed whole ships on top of houses and building. 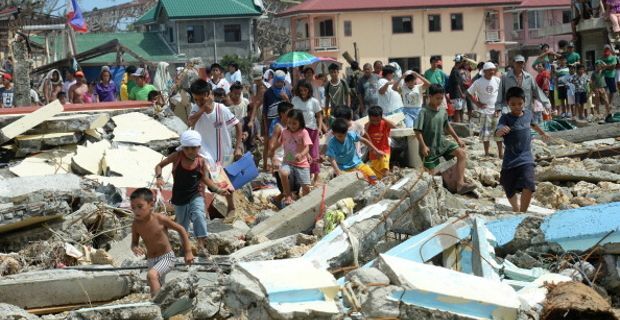 So far in the Leyte province alone 10.000 people have died but the toll is expected to rise. Most of the victims were people who had drowned or were crushed by collapsing buildings and the bodies are now being accommodated in mass graves. Even the airport, itself reduced to a shell, is being used as a makeshift morgue. But the airport of Tacloban is also serving survivors, authorities and media all crowded into the building to find refuge and to try and escape from chaos. From here, the first much-needed supplies have begun to be distributed by the army on Sunday, while hundreds of survivors are queuing in the hope to secure a flight out of the country. Reduced to raiding houses, shops and malls to find supplies, the city survivors also have to face the threat of residents from nearby towns entering the city to steal supplies, with local officials pleading with authorities to declare martial law on looters.